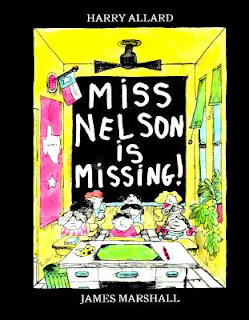 Please, please, please tell me I'm not the only person who remembers this book! I've posted before about my childhood obsession with Reading Rainbow, and this book was featured on the show. I'm not sure why this book suddenly popped into my head (remember, I'm random! ), but it took me a while to figure out what the title was. All I could remember was that it was a teacher who had a dual identity. Thinking back to this I was actually kinda freaked out by that concept as a child. The fact that my teacher could become a completely different person made me skeptical of substitute teachers as though she was pulling a Miss Nelson on our class. Don't remember this one :/ maybe I will buy it lol! This is my FAVORITE book from childhood!!! I even went to see a play based on this book when I lived in Atlanta. It is the first book I bought for Marlie's library. It is brilliant! @Teresha@Marlie and Me ha ha! at last! i had no idea it was a play too. that would be fun to see!